See the phrase “had also been passed on to me”? This phrase is serving the greek word paralambano. The Louw – Nida says this concerning the word paralambano. Anthony Thiselton says the following concerning the meaning of paralambano in 1 Cor 15:3. I find David Garland’s comments concerning 1 Cor 15:3 important as well concerning paralambano. According to Allistar McGrath our English word “tradition” is derived from the Latin term traditio which can mean “handing over”, “handing down”, or “handing on”. In the 1 Cor 15:3 passage Paul is asserting as Garland says “the facts surrounding Jesus’ death and resurrection” were tradition. Tradition to Paul could be a trustworthy source (of course with limitation) of understanding God i.e theology. I am trying to commit more of my theological reading to tradition, creeds etc because I believe they can carry with them something more than just insight. Tradition can carry with it the facts of how God has moved in the past in and among his people. We must be careful with tradition as we should be with any thing outside of the sphere of Biblical authority. Tradition unlike Scripture but similar to reason and experience can just as easily be negative and apposed to God’s mind toward us as it can be positive. Jesus makes this clear in Matthew 15:1-6 and Mark 7:13. There is however a “consistent and unanimous testimony” of the early church that should temper the ethos of our orthodox belief and praxis. In closing take a look at what the Anglican theologian Francis White (1564-1638) says concerning the Puritan and Anglican debate about whether or not the bible could/should be interpreted directly without tradition or the collective teaching of the church through out history. Q: What are your thoughts one White’s comments? Q: What are your thoughts about tradition as a theological influence today in and among Evangelical circles? As an advocate of Sola Scriptura and not Solo Scriptura, I have no problem with tradition shaping our theology and praxis, as long as it is not the final authority. Yet I have to say that White’s comment makes me ask questions. For example, what does he mean by the “ancient catholic church”? Any cursory study of church history will tell you that even within Catholicism and Orthodoxy there has historically been diversity. 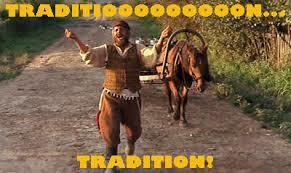 Or, look at those two traditions and you have differences (e.g., filioque). It seems like we often reach theological conclusions and then find traditions to match them or we grow up in a ecclesiological tradition and just accept the standard theology that is found within that tradition.